You may have heard that Facebook has lost millions of users in a short period of time and that its growth has halted. Not true. Here are the facts. Facebook itself released numbers for Q1 2013 during its earnings report Wednesday. Daily active users, monthly active users, mobile active users -- they're all up. In fact, there's been double-digit growth in all of those categories year-over-year. Facebook now has 195 million users in the U.S. alone. Facebook has lost 10 million users in the US and seen no growth in monthly visitors in the UK over the past year, according to data from market research firm Nielsen. However, a closer look at the Nielsen data reveals this isn't quite accurate. Facebook has seen a drop in unique visitors in the U.S. from March 2012 to March 2013 -- on desktop -- from 152.8 million to 142.1 million. But on mobile, use of Facebook's app has skyrocketed from 62 million uniques to 99 million uniques for that same time period. 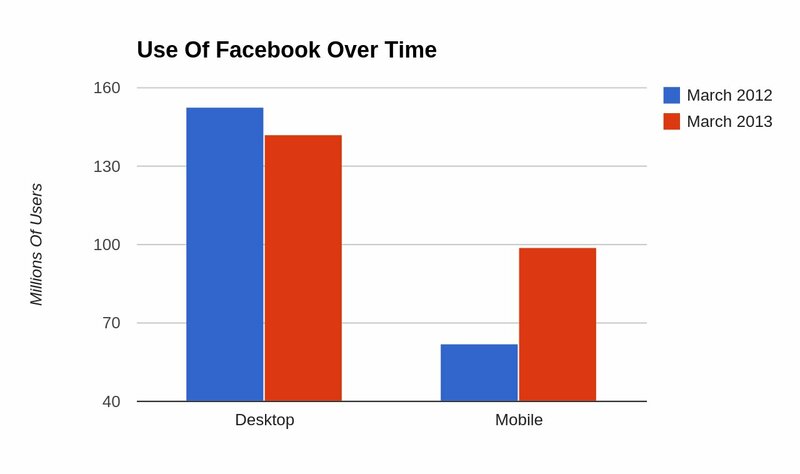 In other words, the data merely reflects a shift from desktop to mobile, and it may even suggest Facebook is gaining users. On top of that, Nielsen doesn't even measure number of individual Facebook accounts. It measures unique visitors, or the number of devices used to access a particular site. So any claims about user numbers cited to Nielsen can't be right. The misleading reports led to all sorts of speculative posts based on the data, like "The Possibility of Peak Facebook," which really were never warranted. It also got picked up by a number of blogs and news sites. One of the companies cited in the reports was SocialBakers. Their CEO Jan Razab quickly fired a blog post taking down the misinformation, writing, "Sometimes, journalists get stats wrong." "Beware of misreading the numbers. Website use might be heading down, but that’s because of the huge shift to mobile currently taking place." Whoa, whoa, whoa. Tone it down! You're literally SCREAMING at all of Facebook. Unless you're injured or just had a baby, there's no point in yelling at the digital world.